With Over 20 Years' of Experience, We Know How to Get Results. Get easy access to necessary forms here and upload securely! We can help determine whether you quality for a social security disability claim. We have over 20 years of experience handling social security disability claims. Contact us today to work with advocates who will help you receive the benefits you deserve. Let Disability Action Advocates Go to Work for You! When you apply for Social Security Disability benefits, it can be an extremely time-consuming and stressful process, and just because you have a disability does not automatically mean that you qualify for benefits. Many people with legitimate disabilities are denied. You should not have to wait for the benefits you need after having experienced severe illness or injury, and Disability Action Advocates (DAA) is here for you. Our experienced legal firm exclusively practices Social Security Disability and can help guide you through the process. By putting your case in the hands of our knowledgeable and dedicated staff you can be confident that you will get the highest degree of professional and ethical standards when you hire DAA. We have one simple goal – to get your claim approved so you can carry on with your life. Disability Action Advocates is a team of practiced disability lawyers in Sacramento who can take your claim through the complicated Social Security disability process. While many people try to navigate the disability system on their own, this is an unnecessary risk to take. Our firm has over 20 years of experience exclusively handling Social Security disability claims. We can maximize your chances of being awarded the Social Security disability benefits and Supplemental Security Income you and your family are entitled to. 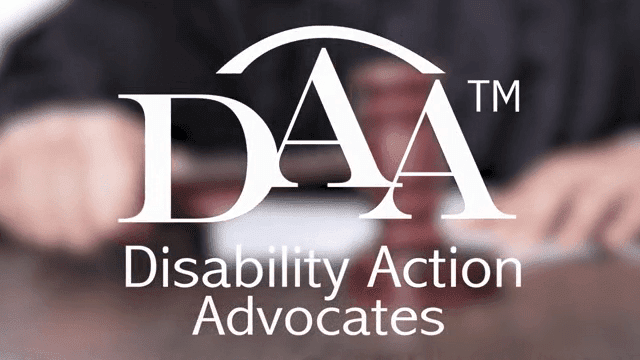 At Disability Action Advocates, we are anAV® Rated firm by Martindale-Hubbell® America’s most trusted legal directory, and our skilled attorneys have successfully pursued thousands of cases for our clients. Even better, we do not charge any upfront fees, and only collect if we win your case! If you are wondering whether or not you should hire an attorney while going through the SSD process, consider the following: Our firm was established because of the high number of denials and the difficulties of getting valid claims paid. DAA is here to help you get through the process with the least amount of frustration and the highest possibility of success. There are several do's and don'ts when seeking Social Security disability benefits, and we strive to help you avoid the pitfalls that arise from the moment we take on your case. After years of paying into the system, it is only fair that you get the benefits you paid for, and we are here to assist you. Don’t hesitate to contact your Sacramento Social Security Disability advocates today at (888) 421-8705! Consultation is free! The goal of our Sacramento attorneys is helping you qualify and obtain benefits for social security disability. We will walk you through the process from the very beginning to ensure that we get you the treatment and benefits you deserve. Watch our helpful videos to learn more about who we are and how we can help! File all forms for the initial application, reconsideration and hearing. Help you through each step of the process so you know what to expect. Coordinate any social security doctor appointments you may have. Obtain all your medical records and gather the necessary information. Review your social security file thoroughly to discover possible weaknesses and determine what is needed in order to obtain a favorable decision in your case. Represent you at a hearing before an Administrative Law Judge. Contact Disability Action Advocates today by calling (888) 421-8705 or filling out the form below.